I’m in the process of designing some new lighting for the house, which I’ll get into in detail later. 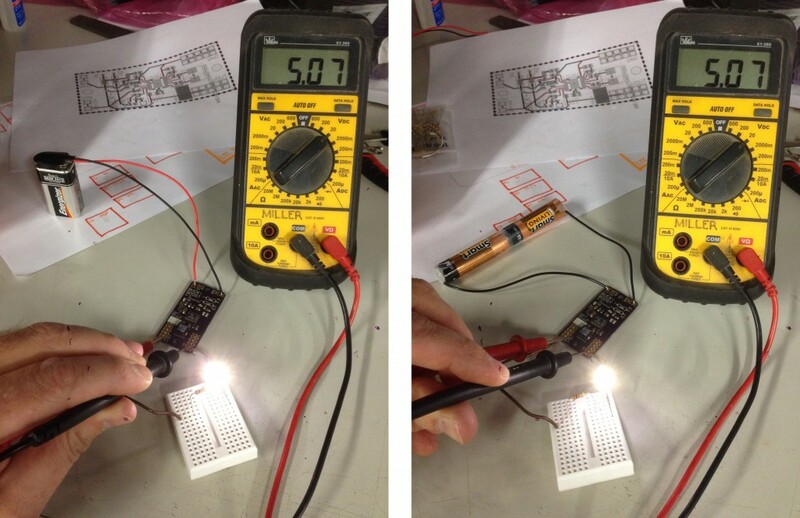 For now I’m experimenting with Luxeon Rebel LEDs to evaluate the different colors and white temperatures. I started by getting a handful of “warm white” and red, green and blue Rebels. I expected the white ones to be too “cool” in temperature, so the R G and B ones could be individually adjusted to provide some warmth to compensate. 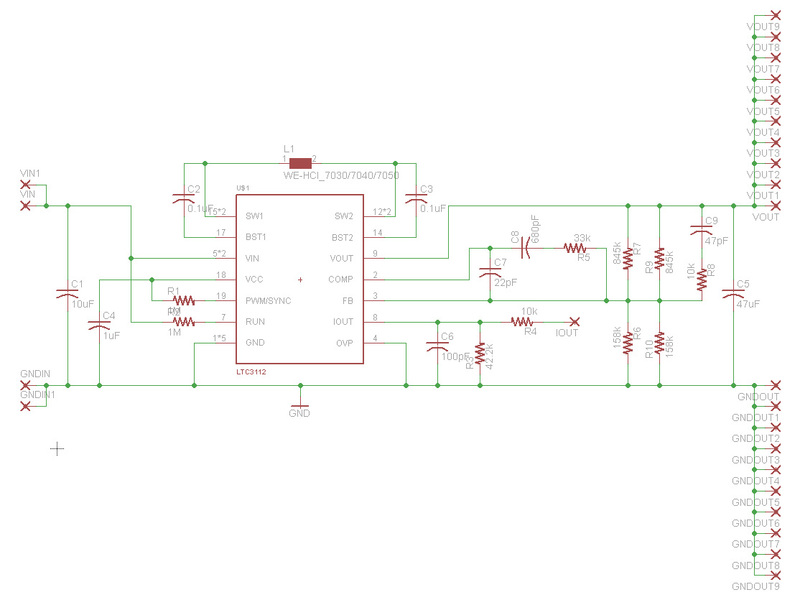 I designed a simple PC board that takes three white LEDs and one red, one green and one blue one. 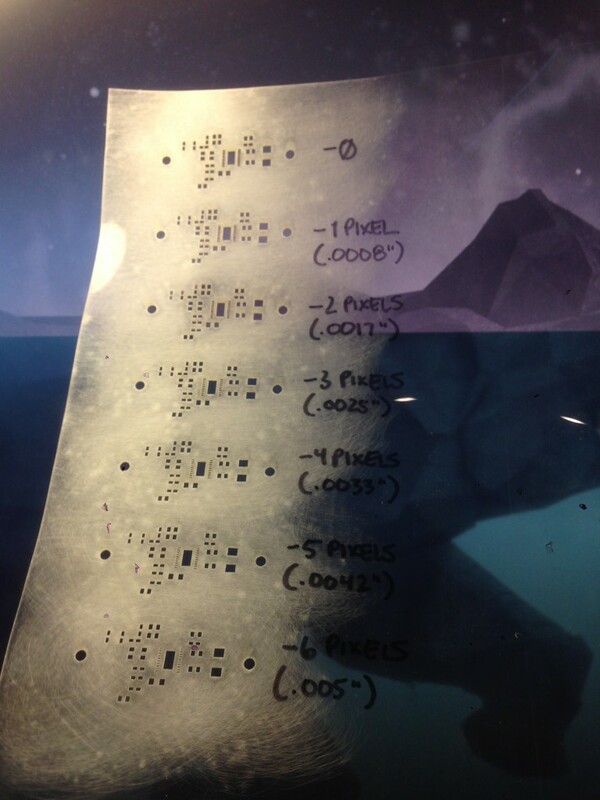 I designed the board in Illustrator and laid out several together on a page, then printed it onto a sheet of toner transfer paper (from Pulsar). 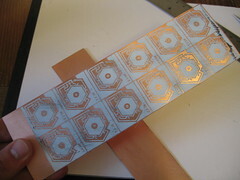 I laminated it to a copper-clad board and ran it through again with a “white TRF foil” as an etch-resist layer, as the toner alone tends to be somewhat porous. I then etched the boards with ferric chloride in a Tupperware dish floating in hot tap water in the bathroom sink, agitating the dish continuously. 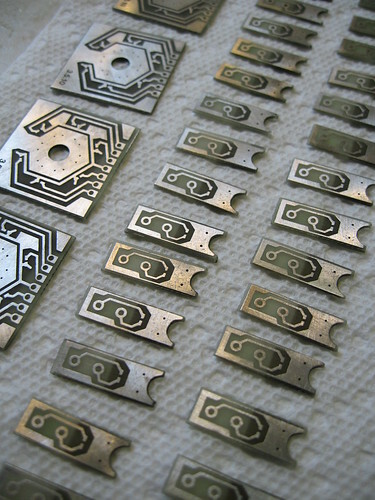 After about 25 minutes in the etchant I rinsed the boards, drilled the holes, divided them up and removed the toner from the remaining copper with lacquer thinner and a scotch-brite pad. I soldered the LEDs onto the board, along with a female header to connect wires to. For testing purposes I connected two C batteries together and plugged them into the header. 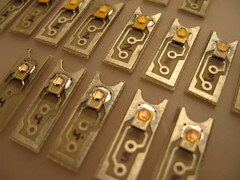 Luxeon Rebels are designed to dissipate heat through a large “no connection” solder pad directly under the chip. There are specific guidelines for the design of the PCB to draw this heat away from the LED which include a multitude of plated vias to increase the copper surface area. 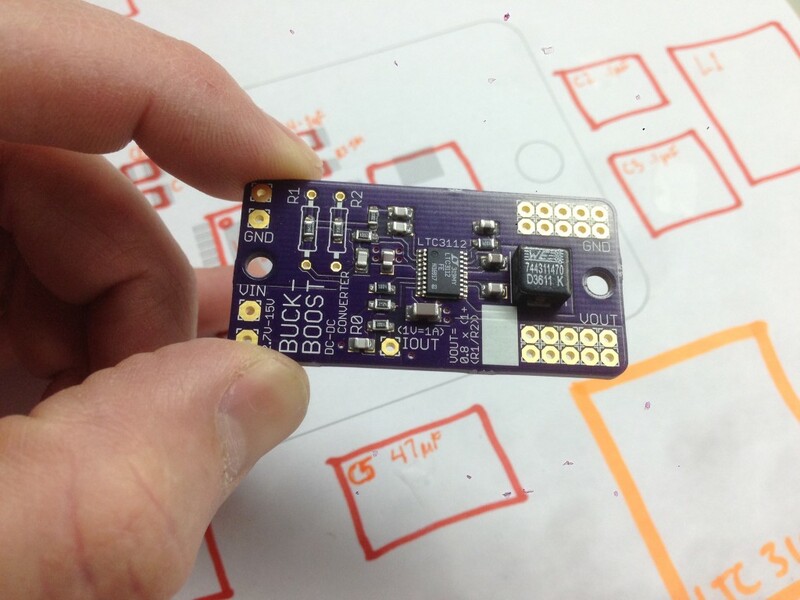 I’m unable to create plated vias in my homemade boards, so my intent is to mount the board to an aluminum plate, using an aluminum machine screw to draw the heat through the hole in the middle of the board. I learned some important lessons from this first attempt. 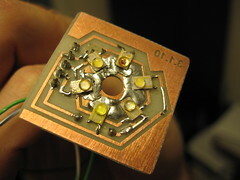 The main problem is hand-soldering these tiny surface-mount LEDs to such a large copper field, which resulted in a sloppy, lumpy mess of solder. 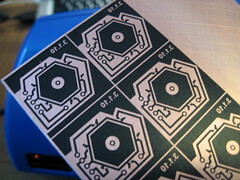 I also realized that I may need to experiment with other combinations of LEDs to get the color right. This first try produced a pleasant white light (and yes, red, green, and blue light does combine into white…I know the theory is fundamental but seeing it happen before your eyes is pretty exciting!) but compared to incandescents and even some of the warm CFLs in my house it still looks very cold. My first attempt at using the tiny Luxeon Rebel LEDs taught me several things, among them how difficult it is to hand-solder them. 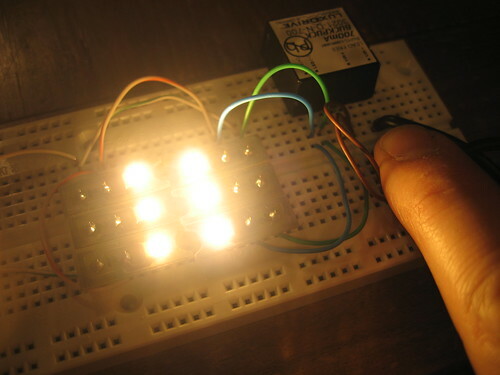 I also realized that I would need to experiment more with the different white LEDs that are available, or potentially using red green and blue LEDs to produce the white I’m looking for (or a combination thereof). 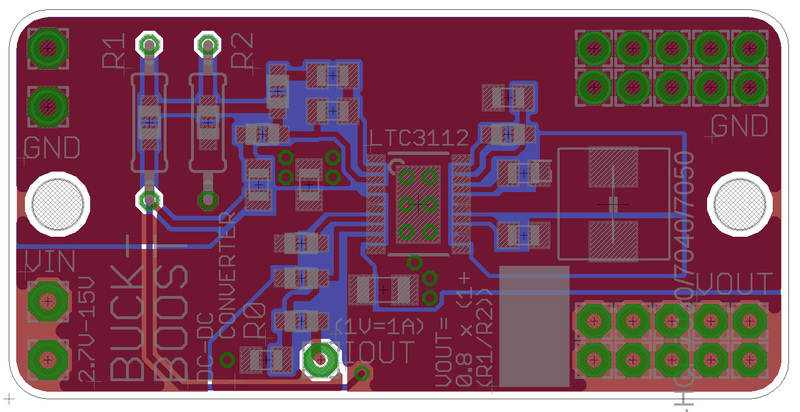 So I designed two new PCBs… a new six-LED board with individual control over each of the LEDs, and a tiny single-Luxeon Rebel breakout board so I can mix-and-match different combinations quickly and easily. 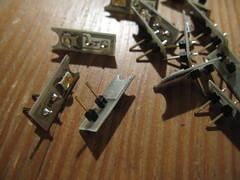 To both designs I also added very tiny dots at the corners of each LED location to help position the LEDs. 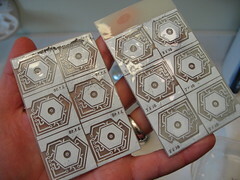 These designs are two-sided, with the back side consisting of a large copper field to help transfer heat to the aluminum heat sink. I made the boards the same way as before, except that I tin-plated the finished boards with Tinnit to protect the copper from tarnishing and to improve the solderability. For this batch of boards I decided to finally try my hand at reflow soldering, using the skillet method described by the Sparkfun guys. 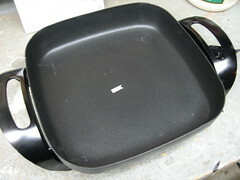 I bought an inexpensive skillet at Target, an infrared thermometer at Lowes, and some no-clean solder paste. The solder paste came in a syringe package but didn’t come with any needles, so I squeezed a little paste onto a paper towel and carefully dabbed it onto the PCBs with a toothpick. 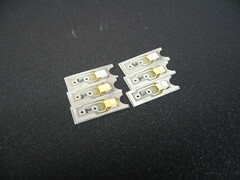 Using a pair of tweezers I placed each LED into position and pressed it into the paste, which held the component fairly well. Before trying any soldering I looked up the reflow profiles for both the solder paste and the LEDs, and experimented with the skillet to see what settings would yield the target temperatures. 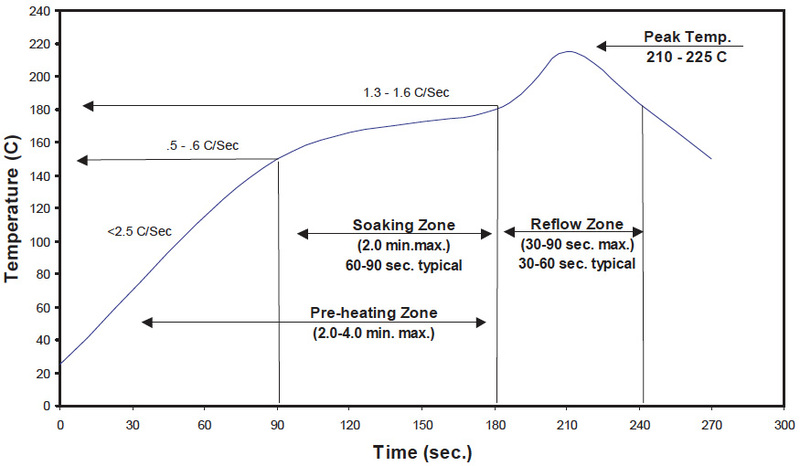 I may one day build an Arduino temperature control for the skillet to more precisely control the profile, but I think these reflow characteristics are pretty flexible and for now it’s working just fine. I put the PCBs into the middle of the skillet (I got wildly different temperature readings from different spots on the skillet) and turned it up to “LOW”, watching the temperature with the thermometer. As the temperature leveled off at around 165°C the boards began to smoke and I turned it up to “MED”. 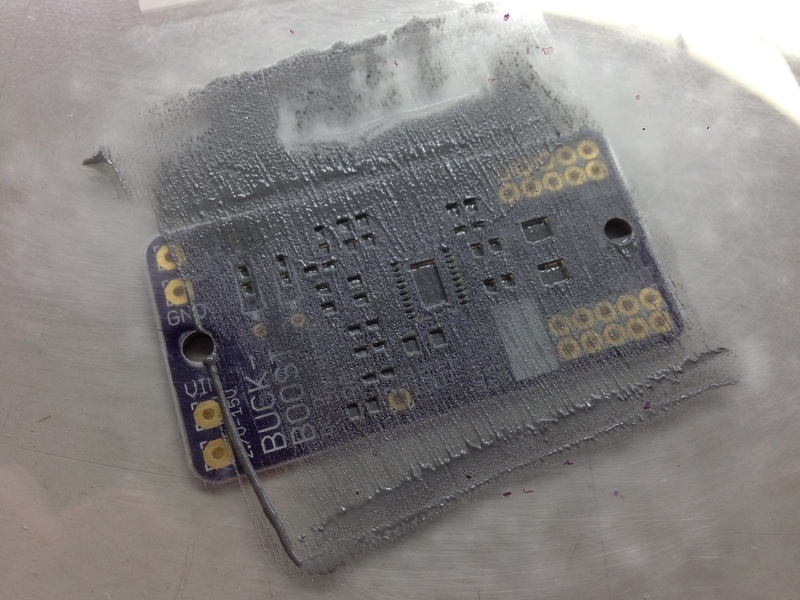 Within a minute or so the solder liquified and flowed nicely, in some cases shifting the LED into perfect alignment with the solder pads (apparently a result of the solder’s surface tension). 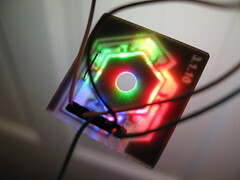 I made breakout boards of several different LEDs: “warm white“, “ANSI 2700K white” (an even warmer white), “amber“, and red, green and blue. 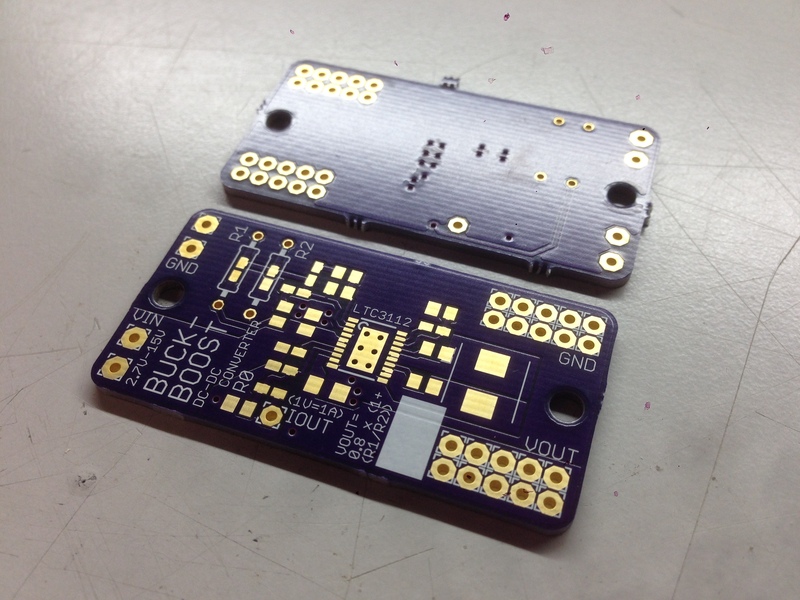 After the skillet reflowing I hand-soldered on a couple of header pins for the breadboard. This breadboard setup allows me to swap out different combinations of LEDs to evaluate the color of the light (here I have six 2700K Rebels installed). 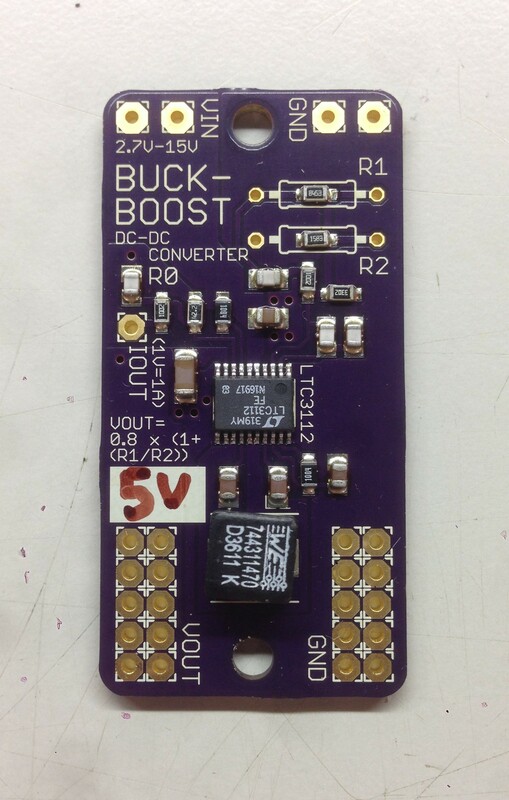 For this mock-up I used a 24VDC desktop power supply powering a BuckPuck LED driver, switched with a momentary pushbutton. I’m getting closer to the color temperature I want, but right now these are all on (full power) or all off. The next step will be PWM control over individual LEDs or groups of two or more to start precisely dialing in the settings. I don’t usually build as I go, without detailed planning or at least some sketches. 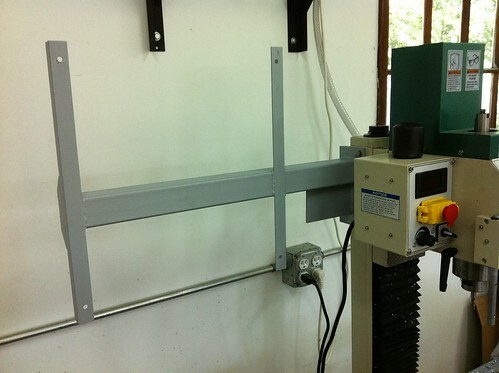 But one Saturday a few weeks ago I had several hours to myself and I was itching to make some physical progress on the CNC conversion, so I took a quick inventory of my metal stock pile and just started building. 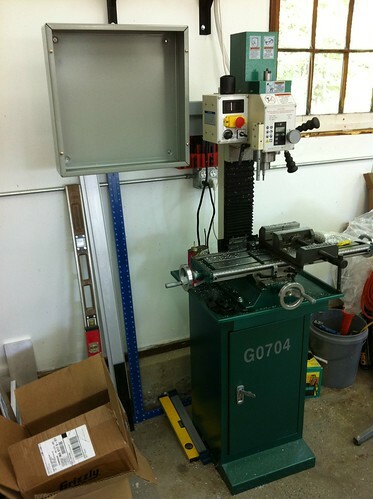 The mounting arm for the CNC controller box–that physically attaches the box to the mill–is a very simple part with well-defined parameters. 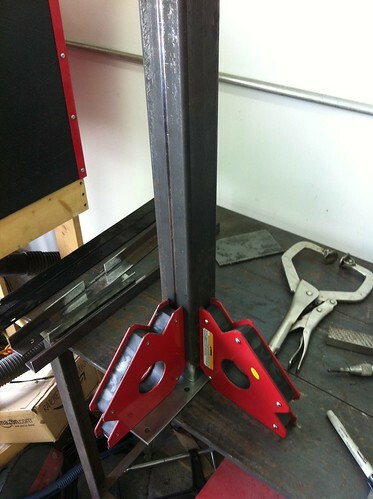 The controller box has four mounting holes on the back side and the column of the mill is a thick iron casting that can be drilled & tapped basically anywhere. I knew approximately where I wanted the box to be, so it was a simple connect-the-dots part design. I had a 2′ length of square steel tube and some angle iron, so I started chopping it up and dry-fit it to the back of the controller box. I MIG welded it together (still practicing that welding… getting better) and cleaned it up, then primed it with some Rustoleum, then did a quick test fit on the mill. 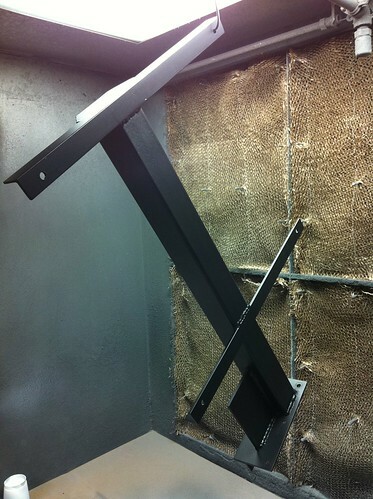 A couple of coats of black lacquer and it’s good to go! 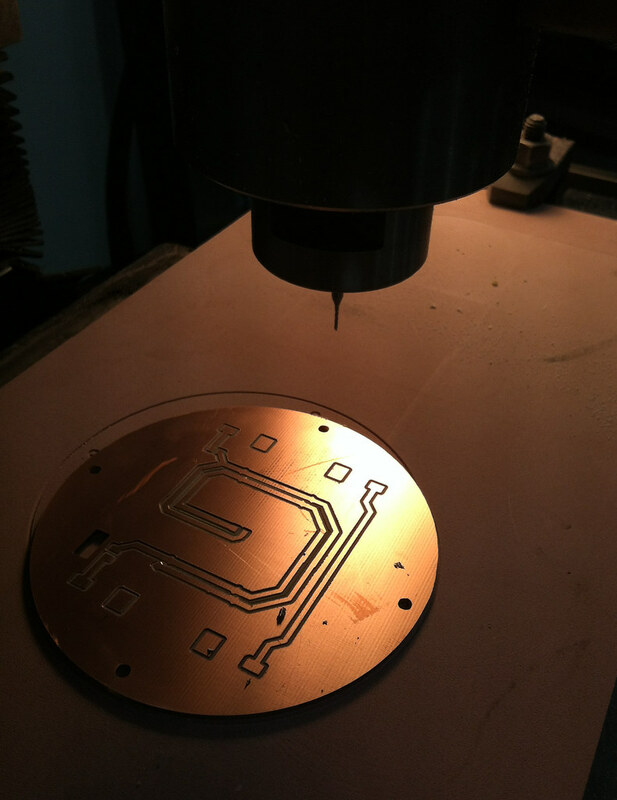 One of my goals for the CNC mill has been to help fabricate PC boards, primarily in terms of cutting out the overall shape and drilling any through holes. 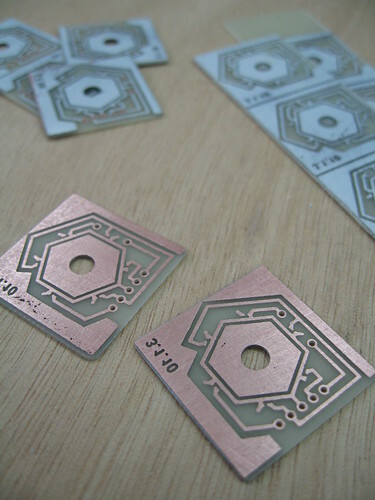 For simple boards, however, it is possible to machine the circuit traces into the copper and avoid the entire photo-etching process altogether. I recently had a chance to try this process out, and the results were quite good. 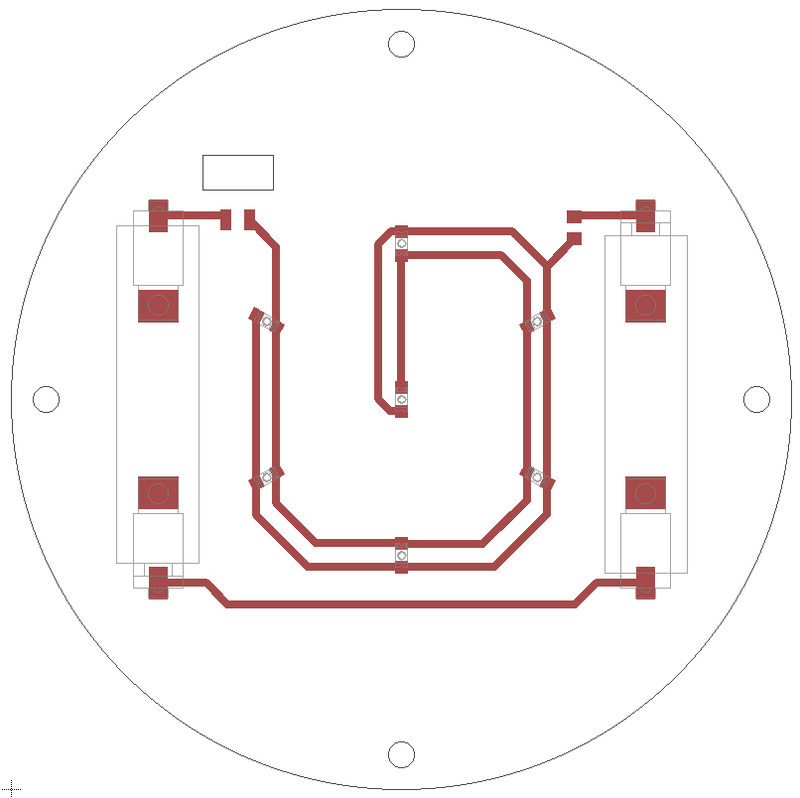 This particular board needed to be circular, and needed to have a rectangular opening for a switch, so CNC routing the outline is really the way to go. The circuit is relatively simple, so it also lends itself well to routing the traces. 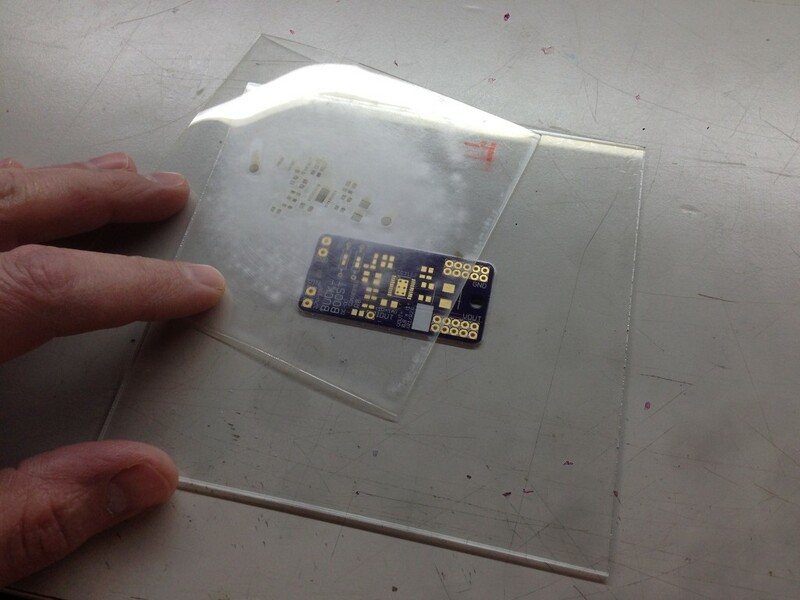 If I were to etch this circuit the usual way with photoresist, developer, etchant, etc. etc. it would have taken three times as long. 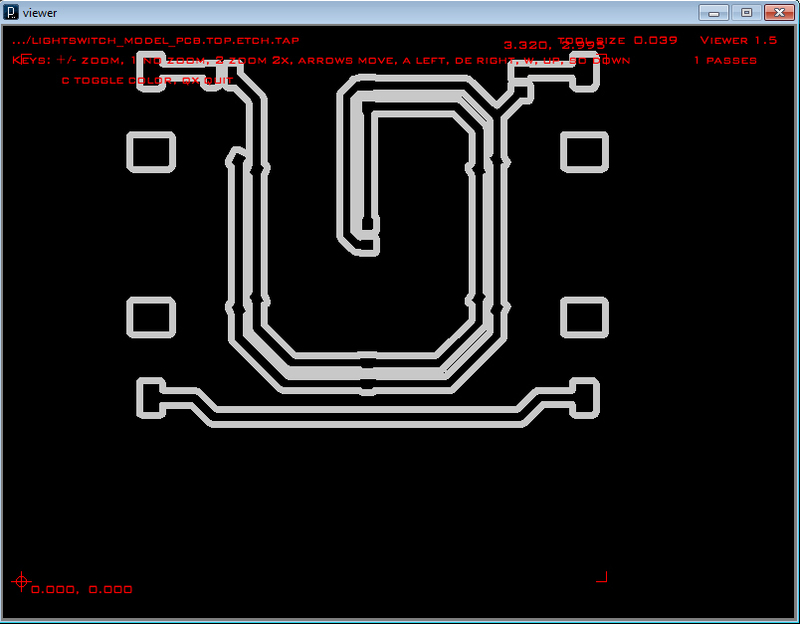 The board was designed in Eagle as usual, but I then used an add-on to Eagle called PCB-gcode to generate gcode from the traces. There are a number of settings to specify depths, tool settings, speeds, etc. but it is fairly self-explanatory. I was never able to figure out how to generate the outlines using PCB-gcode, so I re-drew them in Mastercam and went from there. 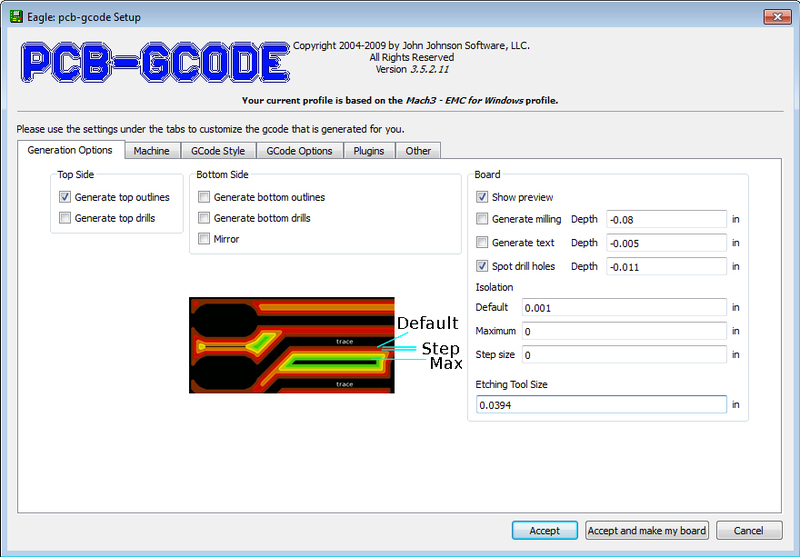 PCB-gcode is supposed to have that ability but there appear to be some bugs in the software that limit its ability to deal with circles and arcs. If anyone has made better progress than me I’d love to hear about it. Anyway the final product came out pretty good. I was pretty pleased with myself having tightened up the backlash to only .004″ per axis, but after machining .024″ wide traces I realized how bad that is. 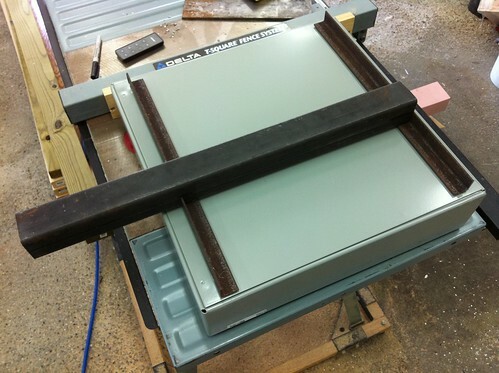 Under the right circumstances this is a good technique to save time, but I wouldn’t try to machine extremely fine traces or tight-pitched pads until I work those last few thousandths of backlash out of my machine.